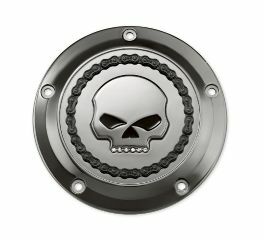 For that dark sinister look choose components from the Harley-Davidson® Skull and Chain collection in chrome and smokey chrome finishes. 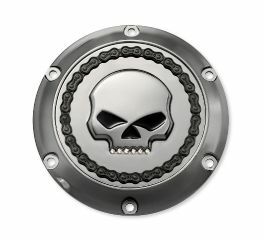 A contrasting 3-D bike chain outlines the iconic Willie G. Skull, adding just a little bit more intensity to your blacked-out ride. 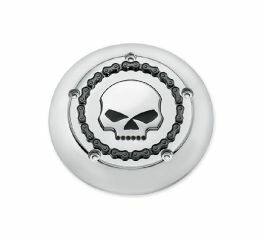 Links to the dark side. 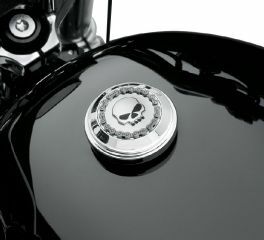 The contrasting 3-D chain rims the surface, and surrounds the distinctive Willie G. Skull with black-filled eyes and rhinestone-encrusted jaw line. 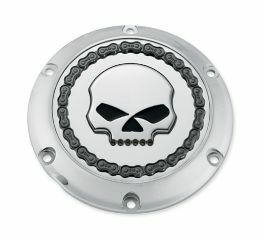 A contrasting 3-D bike chain outlines the iconic Willie G. Skull in the Skull & Chain Fuel Cap Trim. 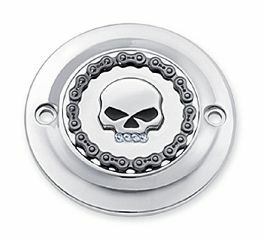 Adding just a little bit more intensity to your blacked-out ride. 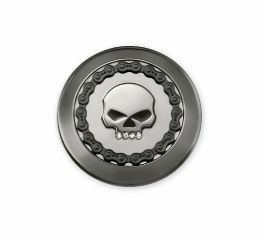 Links to the dark side. 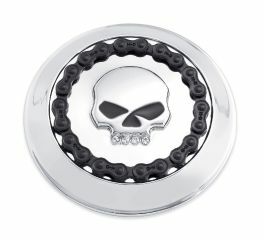 This mirror chrome fuel cap trim stands out in a crowd, with a contrasting 3-D chain that rims the surface and surrounds the distinctive raised Willie G Skull.